On the way out of Pingtung City 屏東市. 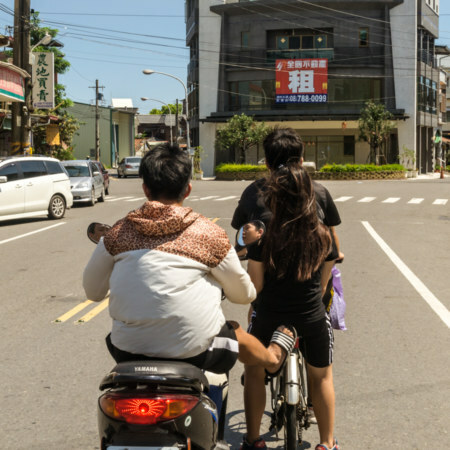 To begin, a few technical notes about riding through the rural sprawl of the Pingtung Plain 屏東平原. 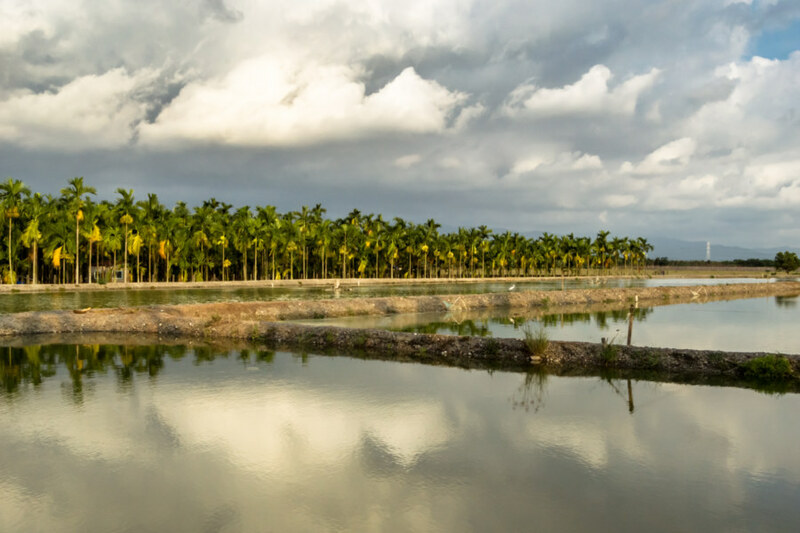 The two biggest challenges were the heat of early summer and the relentless tropical sun. 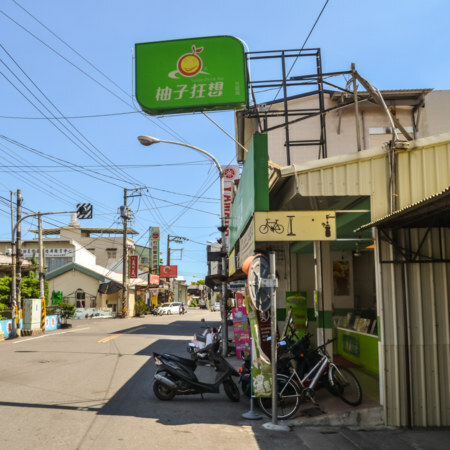 Convenience stores and traditional shops were never far but I still had to take regular breaks in the shade to avoid heatstroke. I was in no rush anyhow; one of my goals on this trip was to see more of this part of Taiwan up close, without much scheduling or advance planning. 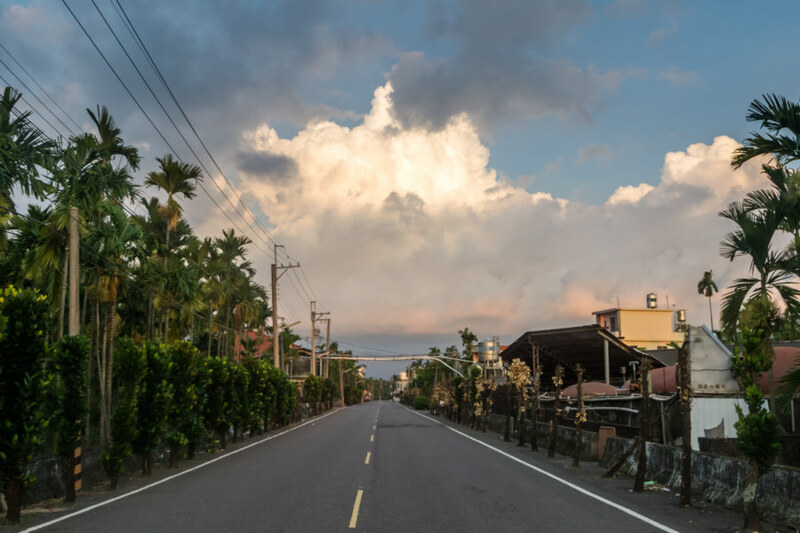 I navigated with the assistance of Google Maps (and full cellular reception almost everywhere I went, this being Taiwan) and eschewed straight thoroughfares for winding country roads. I was operating under the assumption that twists and turns might indicate older and more historic areas. 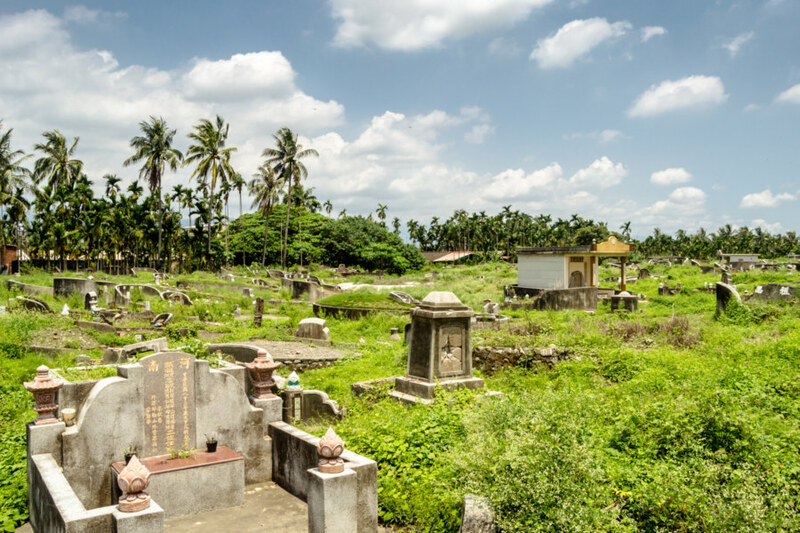 A cemetery on the outskirts of the city. It was a serene place to stop and contemplate the moment before forging on. A Tudigong 土地公 statue on the outskirts of Pingtung City 屏東市. Beyond city limits I cycled through a cemetery on the very edge of Chángzhì 長治 before cutting south through Línluò 麟洛, the first of several Hakka majority districts1 on the way to Fāngliáo 枋寮. I must admit that when I set out on this trip I didn’t know very much about Hakka culture in Taiwan beyond what you can read on Wikipedia2. I have since done some reading to learn a little more about what I photographed and also to make this post more informative and engaging but I don’t pretend to be an expert; corrections are welcome in the comments. A traditional home in Línluò 麟洛. The style is similar to those found in Měinóng 美濃. The Hakka people are the largest minority group in Taiwan, making up about 15% of the population. 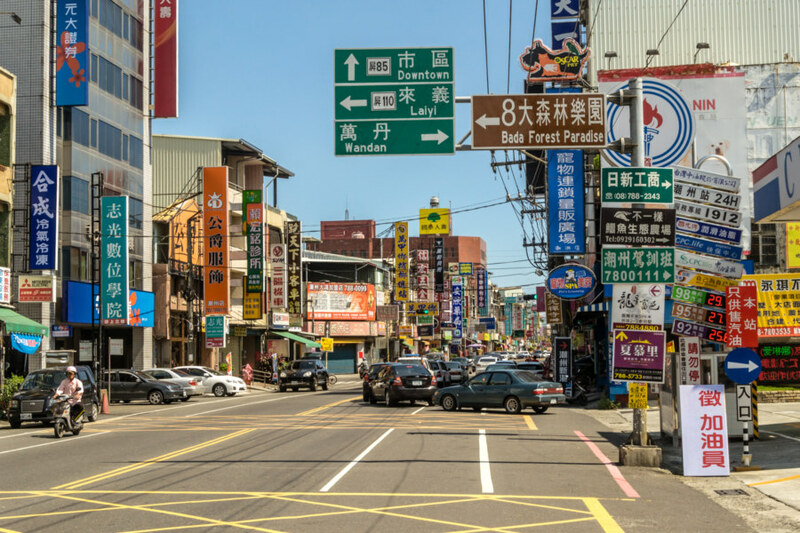 Many still speak Hakka, a language that is not mutually intelligible with either Mandarin Chinese or Taiwanese Hokkien, and their cuisine is widely celebrated across Taiwan. 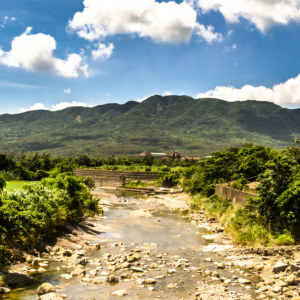 Most Hakka in Taiwan trace their ancestry to the mountainous borderlands of Guangdong, Jiangxi, and Fujian in China. During the Qing dynasty era immigration to Taiwan was controlled by imperial decrees that regularly forbade people from crossing the treacherous Black Ditch 烏水溝 (Chinese pinyin: wūshuǐgōu; nowadays the Taiwan Strait 台灣海峽) on the basis of gender, ethnicity, and point of origin. The rules and how rigorously they were enforced varied over time and, as such, Hakka emigrated to Taiwan in waves, with different groups arriving at different times often settling with others of a similar background. Not all countryside homes are so well maintained. Here is an abandoned mud brick house not far from the main road. 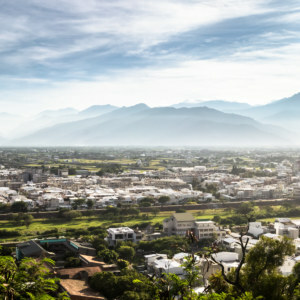 Many Hakka immigrants settled the rugged hills of Táoyuán 桃園, Hsinchu 新竹, and Miáolì 苗栗 in northwestern Taiwan but for the purposes of this post I’m going to focus on those Hakka who settled the flatlands of rural Kaohsiung 高雄 and Pingtung 屏東, an area that came to be known as Liutui 六堆 (Chinese pinyin: Liùduī, literally “six stacks” or “piles”, though the meaning is closer to “team” in Hakka). The name refers to the six units of a Hakka self-defense force formed in response to a short-lived rebellion against Qing rule led by Zhū Yīguì 朱一貴 in 1721. Zhu Yigui captured Tainan 台南, expelled the Qing officials, and proclaimed himself king. Internal divisions and Qing reinforcements doomed the uprising but not before Zhu sent rebel troops east into modern-day Pingtung 屏東 where they were successfully repelled by the Liutui volunteers3. After the dust settled this frontier defense force became something of a local tradition, taking up arms against hostile bandits, rebels, indigenous warriors, and any other threat to the Hakka communities stretching along a north-south axis from Jiaxian to Jiādōng 佳冬. Taiwan under Qing rule sounds, in many ways, not unlike the Wild West of America. A simple Hakka home in Zhútián 竹田 with a distinctive cubic motif running along the base. On a previous bicycle trip to Měinóng 美濃, toward the north end of the old Liutui area, I observed differences in the style of more traditional homes that presumably indicated a Hakka, rather than Hoklo, association. Similarly, while riding south through Zhútián 竹田 I noticed many homes that were different than the norm in some way, usually in terms of decorative motifs like the geometric patterns you’ll notice in some of these photos, the choice of colours, or the style of the biǎn’é 匾額 (naming plaques) over doorways. 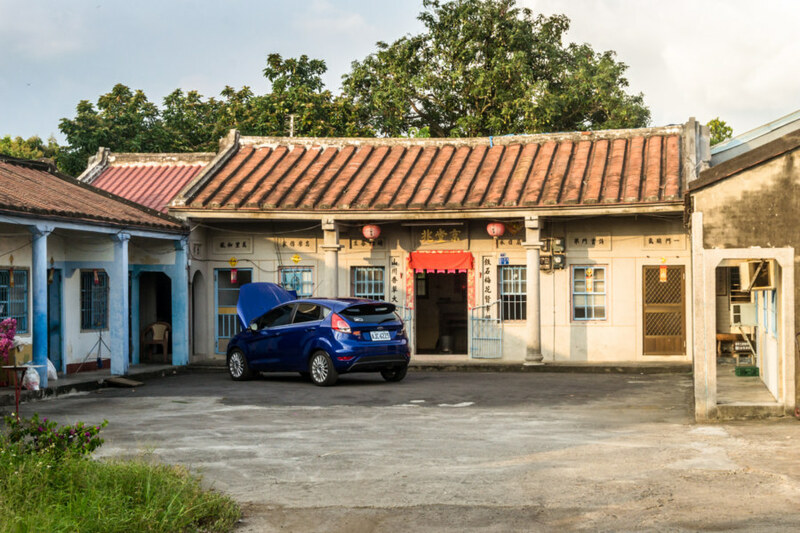 Sometimes those differences were structural, for it isn’t uncommon to see squat and blocky Hakka households looking much like sanheyuan (traditional U-shaped Taiwanese farm houses) without the adjoining wings. 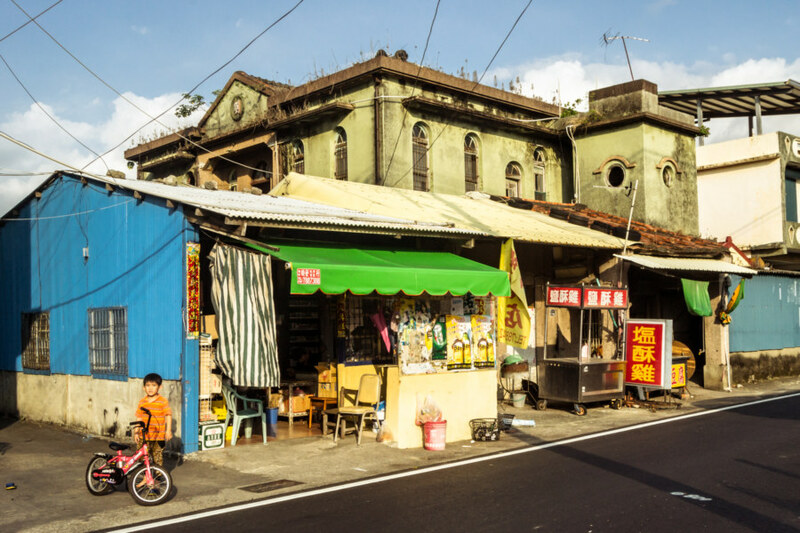 I have read that traditional Hakka buildings are much more subdued in their appearance so there is something of a mystery here: why would older buildings in Hakka areas be more colourful and diverse than elsewhere in rural Taiwan? This strikingly beautiful building in Zhutian is the gateway to Liutui Martyrs’ Shrine 六堆忠義祠, a monument to the fallen heroes who sacrificed their lives to defend local communities. An unusual temple with a striking blue and teal rooftop caught my eye as I swung around a bend somewhere in Zhútián 竹田. While doing some research for this piece I discovered that this is the gatehouse to what you might call, in English, the Liutui Martyrs’ Shrine 六堆忠義祠 (pinyin: Liùduī Zhōngyì Cí), apparently the oldest of dozens of Hakka shrines honoring the Yìmín 義民, or righteous people4, who died defending their new homeland. Originally known as the Loyalty Pavilion 忠義亭 (pinyin: Zhōngyì Tíng), a simple shrine was built on this site after the 1721 uprising to commemorate those who fought against the forces of Zhu Yigui. The ranks of the fallen expanded with the many armed conflicts of the subsequent decades but the Liutui were eventually defeated in the final battle of the Japanese invasion of Taiwan in 18955. The shrine languished in Japanese times but underwent a massive restoration shortly after the KMT arrived in Taiwan. 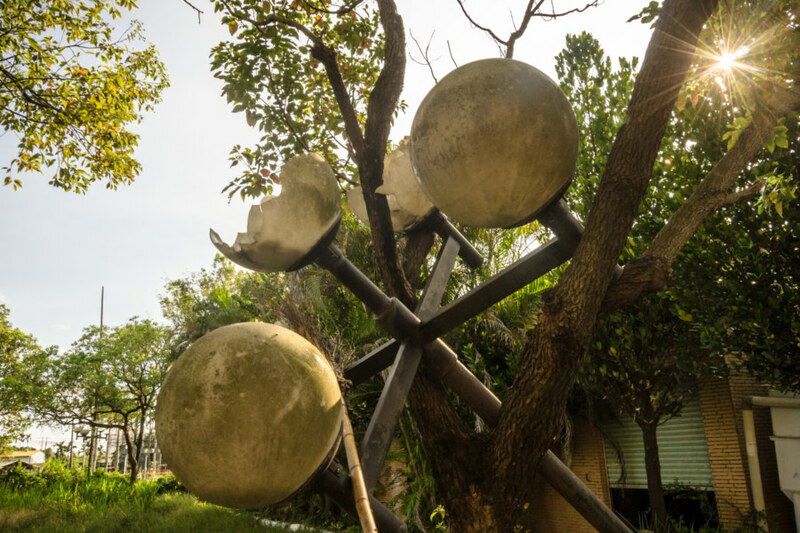 More recently the complex was renovated and expanded to include the Pingtung County Hakka Cultural Museum 屏東縣客家文物館. 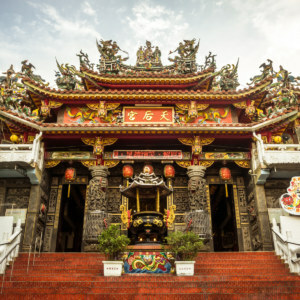 Bāozhōngtíng Yìmín Temple 褒忠亭義民廟 in Hsinchu 新竹 is the top-ranking Yimin temple in Taiwan but the modest Liutui Martyrs’ Shrine is the oldest. Knowing all of this now I wish I had hopped off my bicycle to take a closer look at this intriguing place—but all I did was snap a picture of the pretty rooftop before moving on. 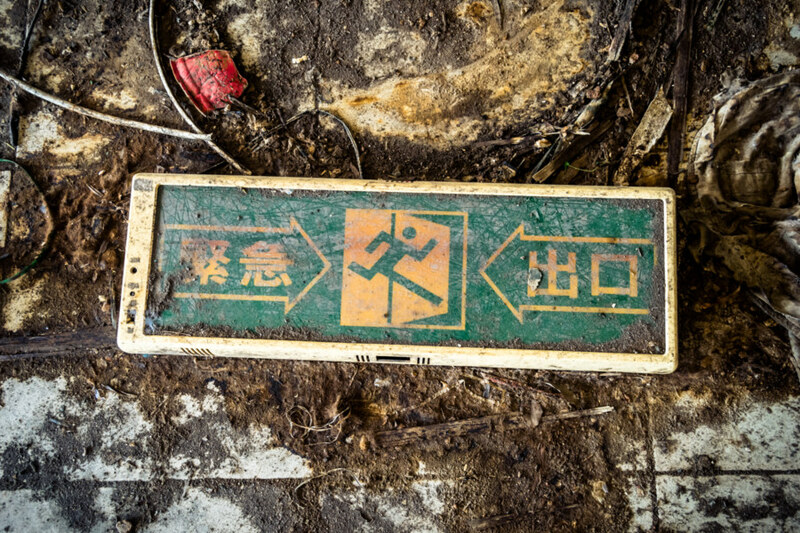 An abandoned home somewhere around Xīshì Station 西勢車站. A drink shop in a small village with a bike pump on hand. I didn’t stop to check if it was actually there. That’s exactly what it looks like: one kid on a scooter pushing two more on a bike. Insanely irresponsible; welcome to south Taiwan! The sign forest on the way into Cháozhōu 潮州. Even this small town of 55,000 feels like a big city. 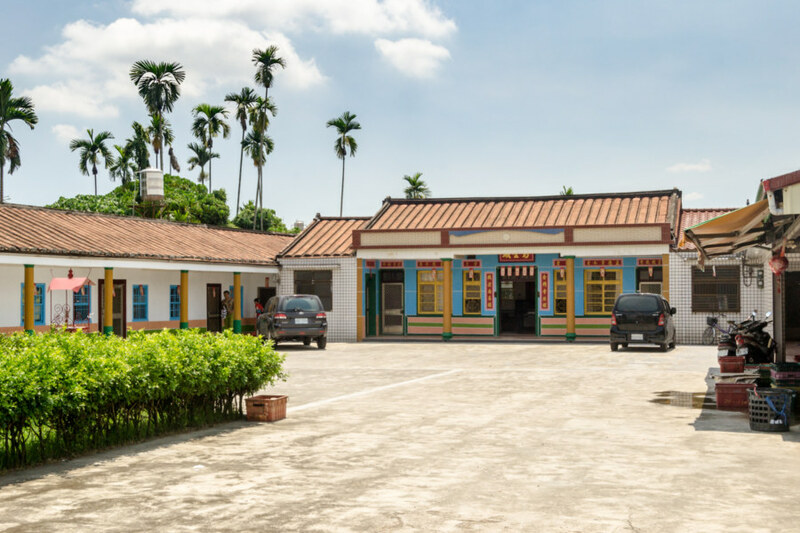 Soon I arrived on the outskirts of Cháozhōu 潮州, a settlement of approximately 55,000 residents named after the city of the same name in far eastern Guangdong, China, where most of the original settlers emigrated from. Historically this part of China was known in English as “Teochew”, an antiquated romanization of the same characters in “Chaozhou” still used to describe its people, language, and cuisine. The Teochew people speak a dialect of Min, the same family that includes Taiwanese Hokkien, and appear to have fully assimilated into the Hoklo majority. 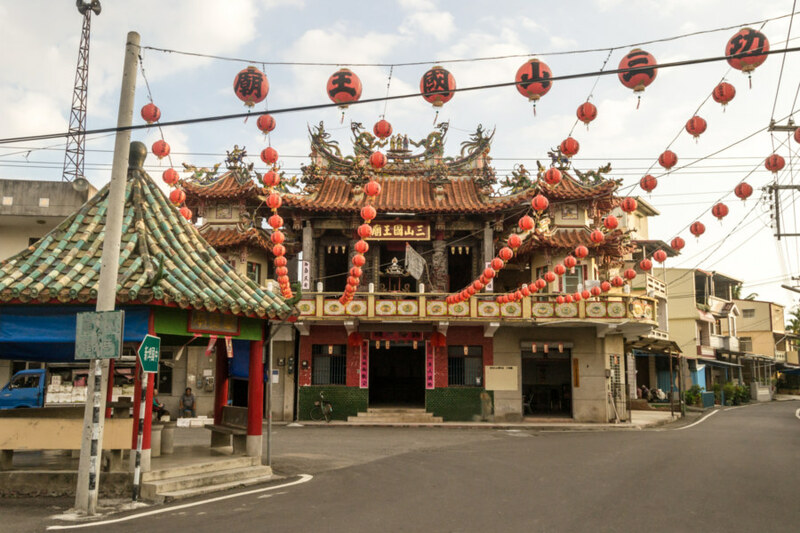 Cháozhōu 潮州, despite being one of the largest towns in Pingtung 屏東, was not part of the Liutui area due to its different ethnic and linguistic composition, although it wasn’t at all uncommon for Teochew people to mix with Hakka and even join the Liutui defense force. 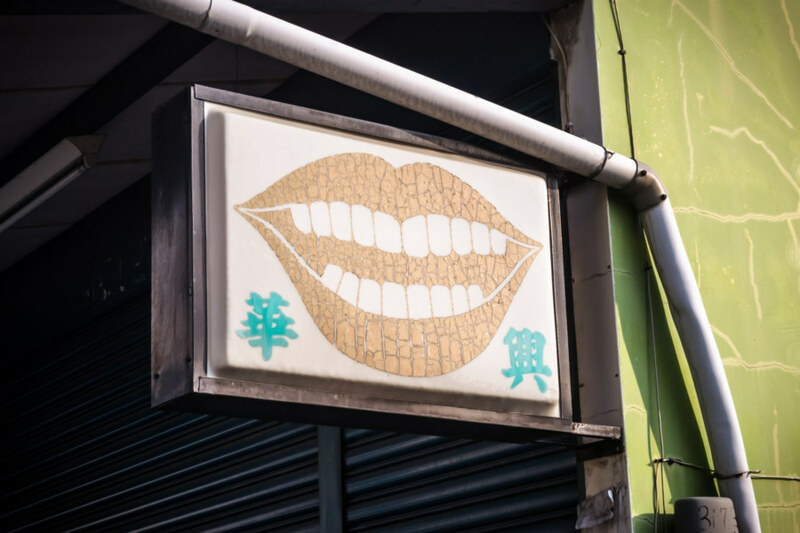 Nowadays Chaozhou is home to a large Hakka population and signs of Hakka culture are readily seen just about anyplace you look—if you know the signs. 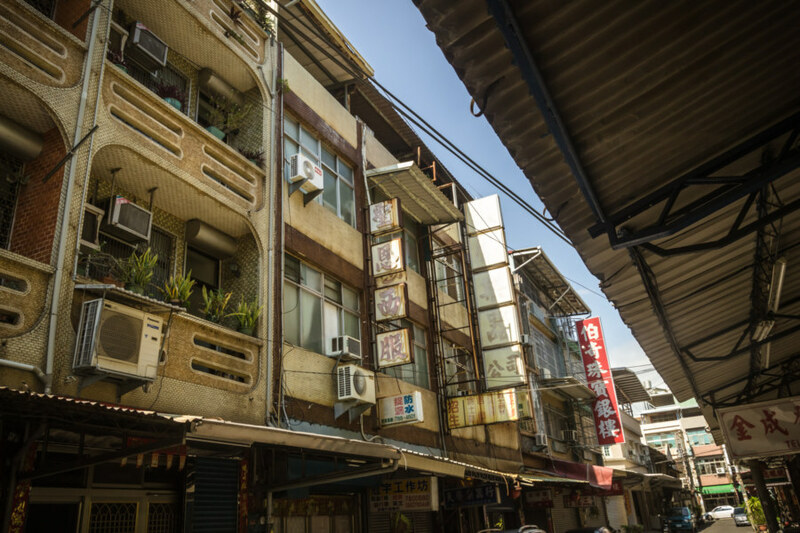 The retro streets of Chaozhou. The entire town had a very vintage feel to it. Breakfast: fresh beets at Eske Place in Pingtung City. Lunch: local Hakka fare at a noodle shop in Chaozhou. I rode around Cháozhōu 潮州 for a while in search of all the usual things I look for: cool temples, famous shops, interesting architecture, mysterious ruins, and so on. 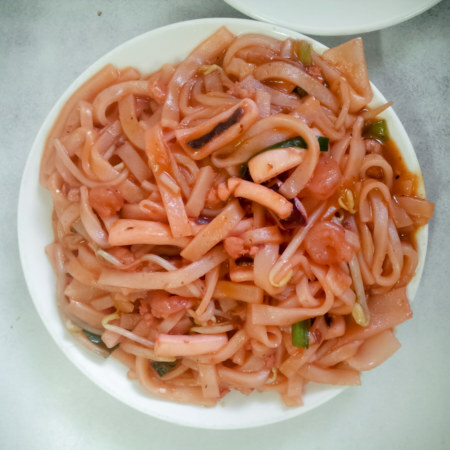 I didn’t end up finding much, though I did stop at a popular Hakka eatery for a plate of pink noodles and blobs of what I would assume are squid or octopus. After that quick snack I wandered over next door to check out what appeared to be the main temple in town, the Chaozhou Three Mountain Kings Temple 潮州三山國王廟. 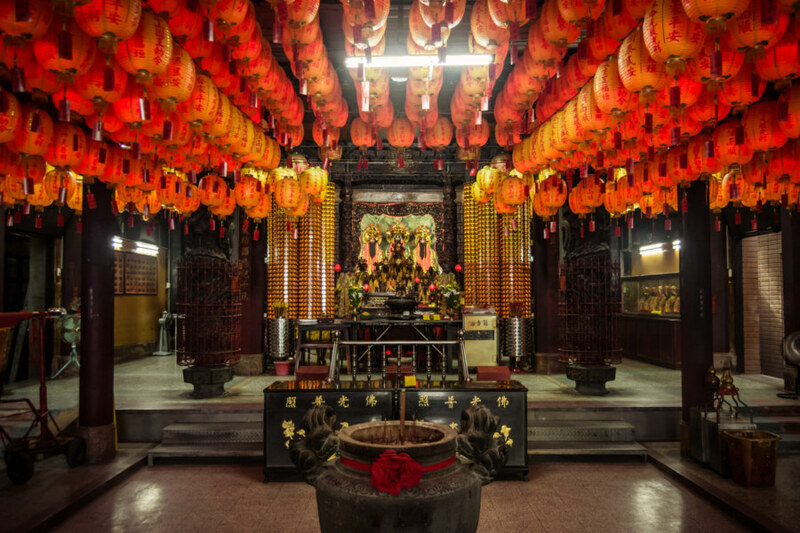 Inside the big temple near the traffic circle in Chaozhou. Unsurprisingly, the main gods venerated here are the Three Mountain Kings 三山國王. 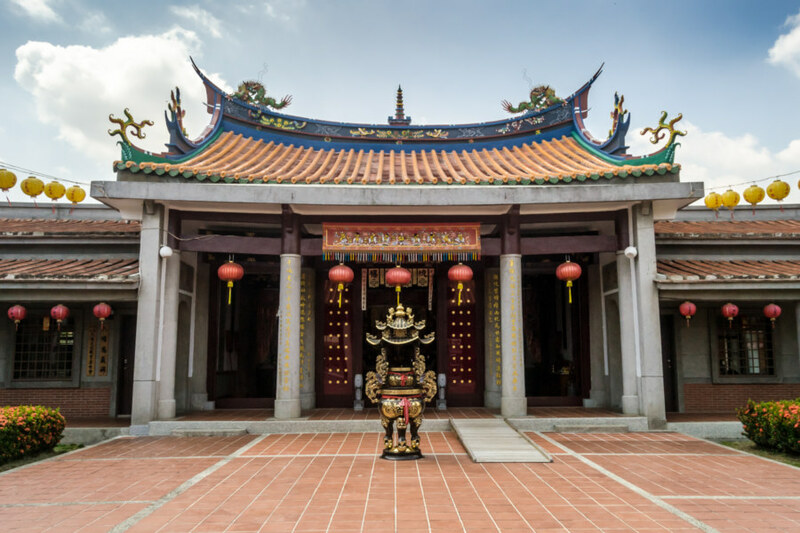 The Lords of the Three Mountains or Sānshān Guówáng 三山國王 are considered to be the patron deities of the Hakka people in Taiwan. Now that I know to look out for them I’ve noticed temples venerating the Three Mountain Kings in pretty much every Hakka area I visit. Their origin story is unusually straight-forward: centuries ago a flood devastated a town in eastern Guangdong, China. Residents prayed to three nearby mountains, asking for the rain to stop, and soon it did. Since then all kinds of legends have sprung up about the potency of these three gods. 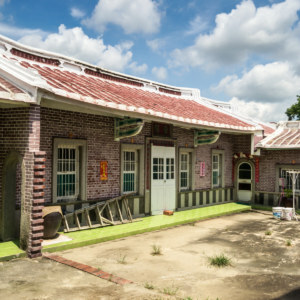 Formerly a Japanese colonial era post office built in 1916, now the Pingtung Story House 屏東戲曲故事館. 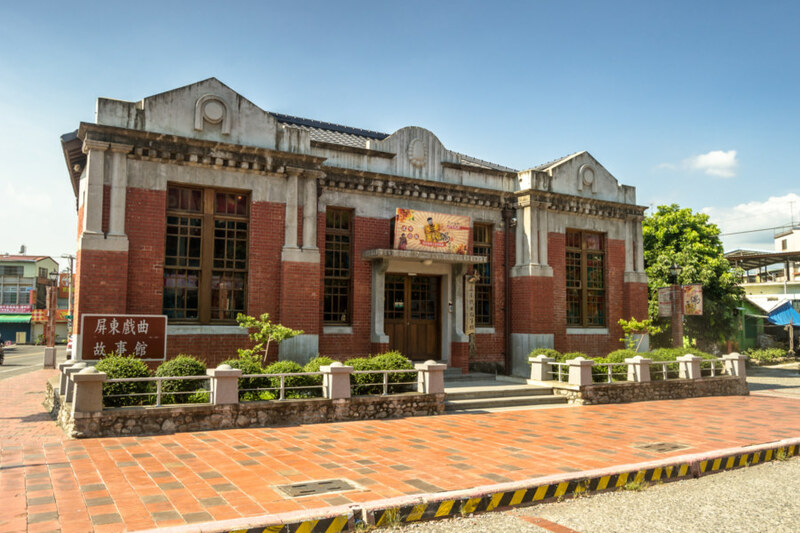 I meandered around town in search of old architecture and soon encountered the Pingtung Story House 屏東戲曲故事館, originally built during the Japanese colonial era in 1916 to serve as the town hall and, later on, a post office. It was recently restored and opened in 2012 as a small museum and event space. 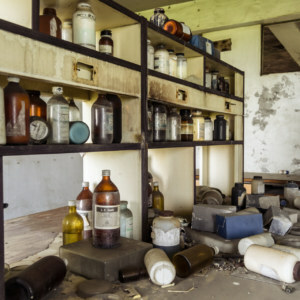 I didn’t stay long enough to check out the interior—I was eager to scope out the supposedly abandoned hospital on the south side of town. 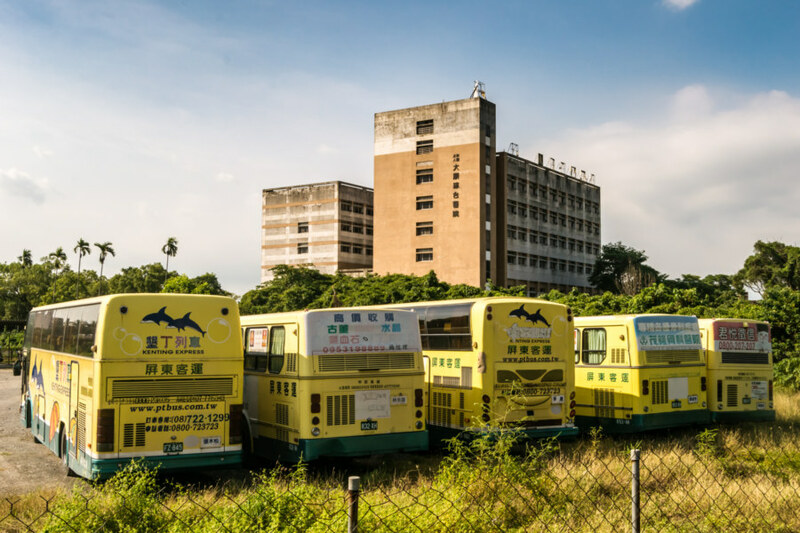 Bus parking behind an abandoned hospital on the outskirts of Chaozhou. This place is locked up tight! They’ve even enlisted the services of a gecko to seal the entrance. A rather scenic bunch of broken lights. And hey, what’s that in the background? Lens flare hell yeah! A visit to the country dentist shouldn’t have to be so creepy. Back on the open road I cycled south through a landscape of rice paddies, aquaculture ponds, light industry, and small villages. 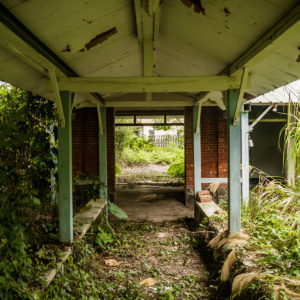 Not long after leaving the hospital behind I noticed another abandonment by the roadside, this time a beautiful old Japanese colonial era mansion in the middle of an old village. I haven’t been able to learn too much about it but based on the character on the facade I named it the Chaozhou Liu House 潮州劉厝 and wrote a whole post about it not long after completing this trip. A little further down the road I passed by another intriguing ruin: Jiǔkuàicuò Catholic Church 九塊厝天主堂, also the subject of a full write-up on this blog. 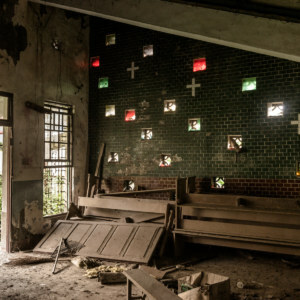 I didn’t realize it at the time but this abandoned church added one more piece to the puzzle of Pingtung’s ethnic make-up. 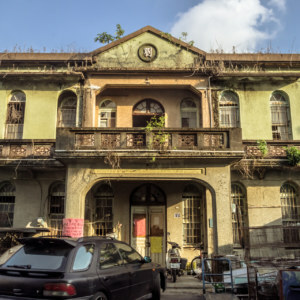 The church was built sometime in the mid-20th century for Taiwanese indigenous people from the Makatao tribe who migrated here for work in the sugar industry. When the industry collapsed these workers presumably moved on and the church was left to the elements. Read more about the church in this post. 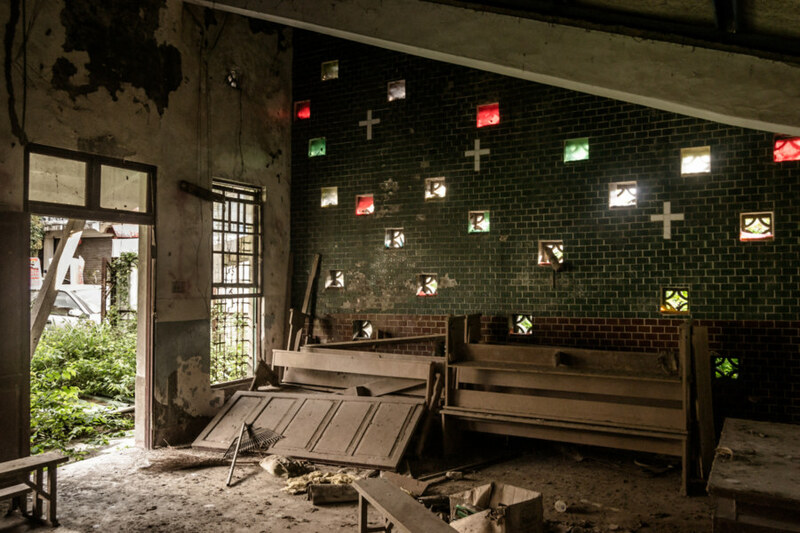 Inside the abandoned Catholic church on the southern outskirts of Chaozhou. One last look at the abandoned Catholic church from the back of the courtyard at sunset. 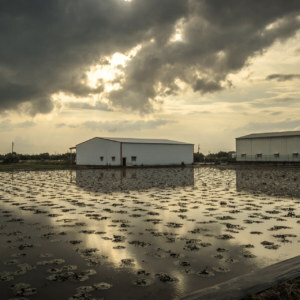 Areca palm and aquaculture ponds in rural Pingtung. Not pictured here are all the annoying insects that love to hang out in such places. There wasn’t much daylight left by the time I was done with the church. I set out into the countryside, riding fast and making few stops. I was intent on making it to at least one more place of interest before the dying light drastically limited my photographic opportunities. 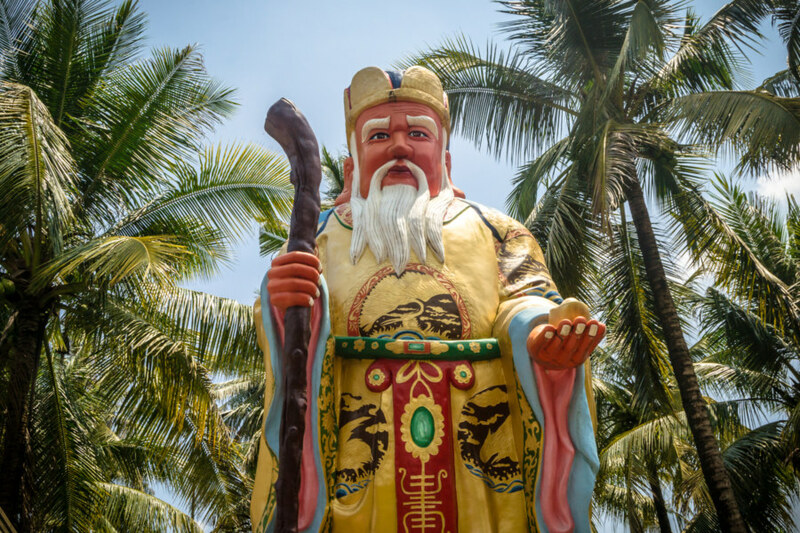 After riding through palm plantations and more rural sprawl I passed through Jiàngōng Village 建功村 and snapped a quick picture of another temple venerating the Three Mountain Kings. A little ways down the road I arrived in the old town of Xinpu 新埔, a loose gathering of a few hundred households spread out in an arc along the highway. 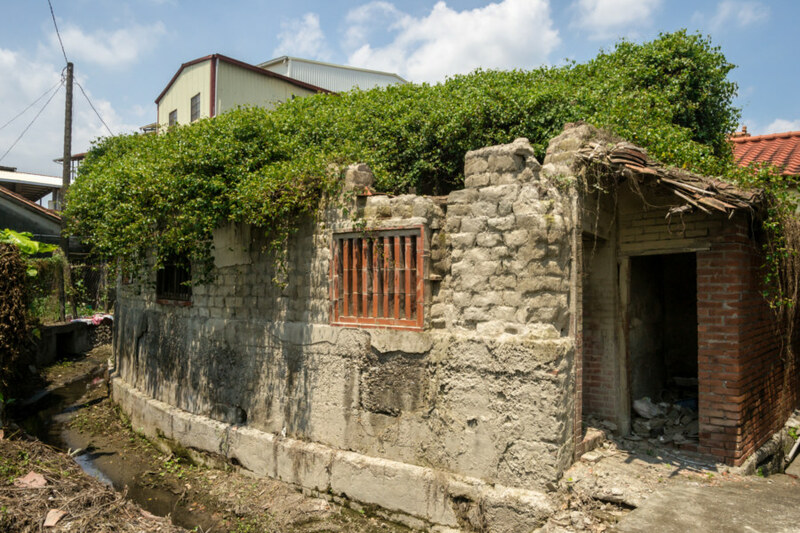 An old home in a small village on the outskirts of Xinpi. Yet another temple devoted to the Three Mountain Kings. This is definitely Hakka country! 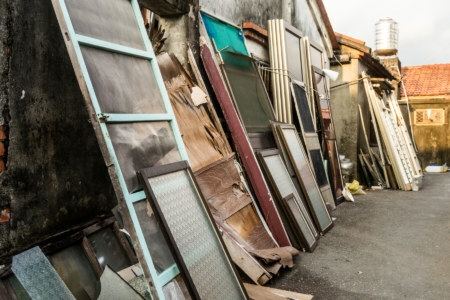 Broken windows and doors collected in a side lot. 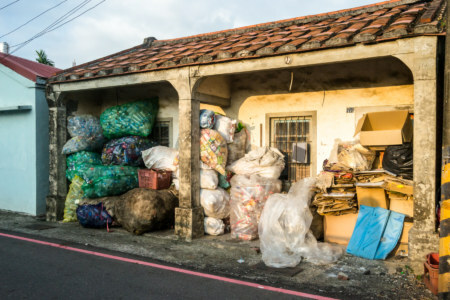 Recycling storage next to an old home in Xinpi. An old home in Xinpi with an unusually pointed horseback gable. The shape of these gables alludes to one of the five classical Chinese elements, fire in this case. Xīnpí 新埤 was also part of the Liutui area and still retains a significant Hakka population. The big temple in the middle of the oldest part of town venerates—you guessed it—the Three Mountain Kings. But there was something noticeably different about Xinpi, even in the dusk. 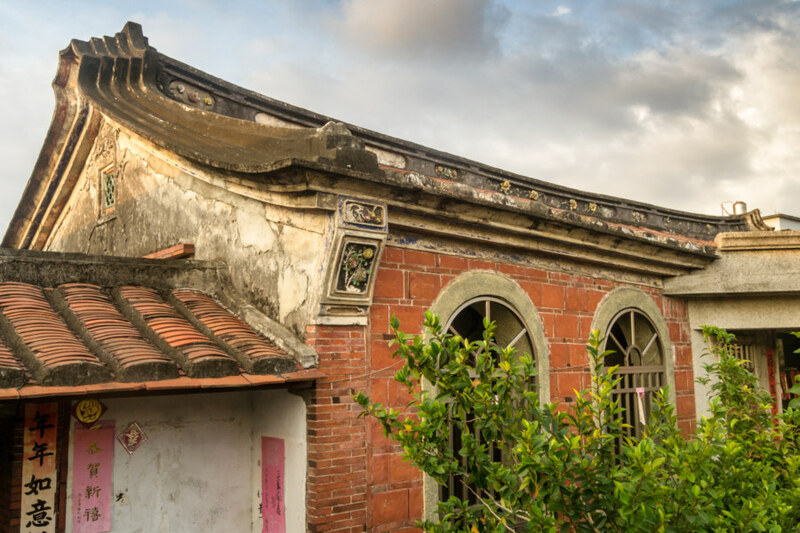 The south side of town displayed a remarkable assortment of traditional architecture, from sanheyuan (traditional three-part farm houses) to more blocky structures embellished with gorgeous architectural flourishes. 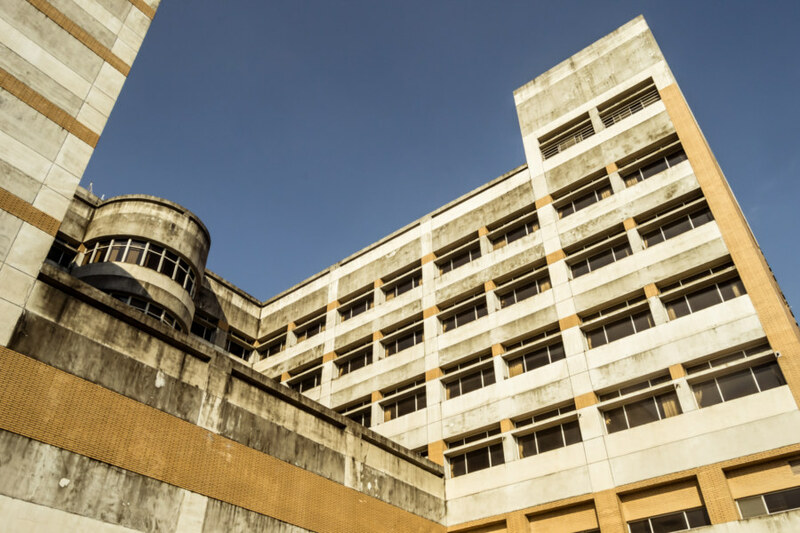 Take, for example, the scalloped corner of the building pictured above, formally known as a horseback gable 馬背山牆 (pinyin: mǎbèi shānqiáng). 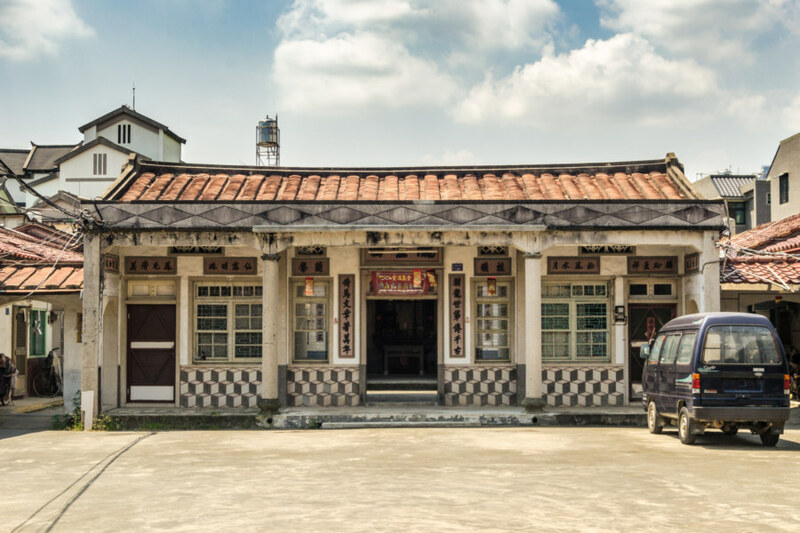 While writing up my visit to Yìfāng Old House 義芳居古厝 in Taipei 台北 I learned that these gables are shaped according to the principles of fēng shuǐ and the wǔxíng 五行, or five classic Chinese elements of wood, fire, earth, metal, and water. I feel as if I have often seen the straight or curved shapes representing wood and water but the jagged outlines of this particular gable allude to the flickering of a flame, something new in my experience. 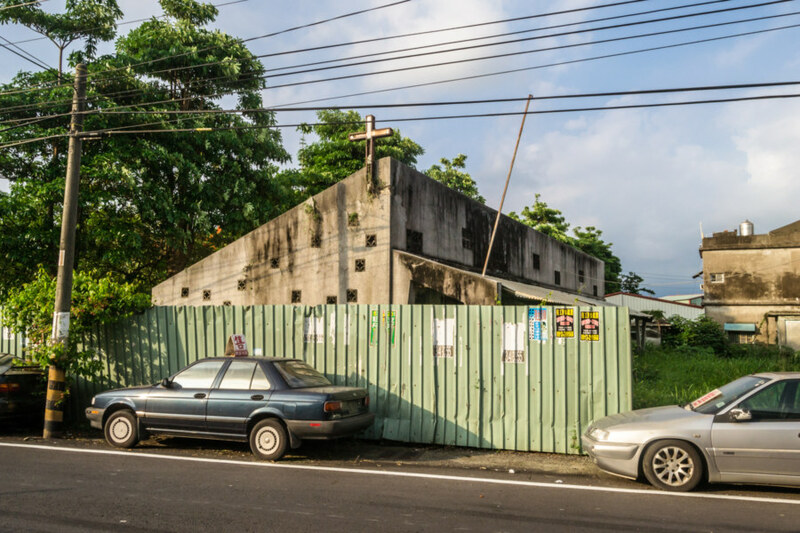 This little corner of rural Pingtung 屏東 held one more surprise for me: the Xinpi Machine Gun Fort 新埤反空降機槍碉堡, a story I already wrote up at length (click through for more photos). In short, I noticed a sign along the highway that said something about a “fort”, went to go take a look, and found this squat concrete structure along an old irrigation canal at the edge of town. 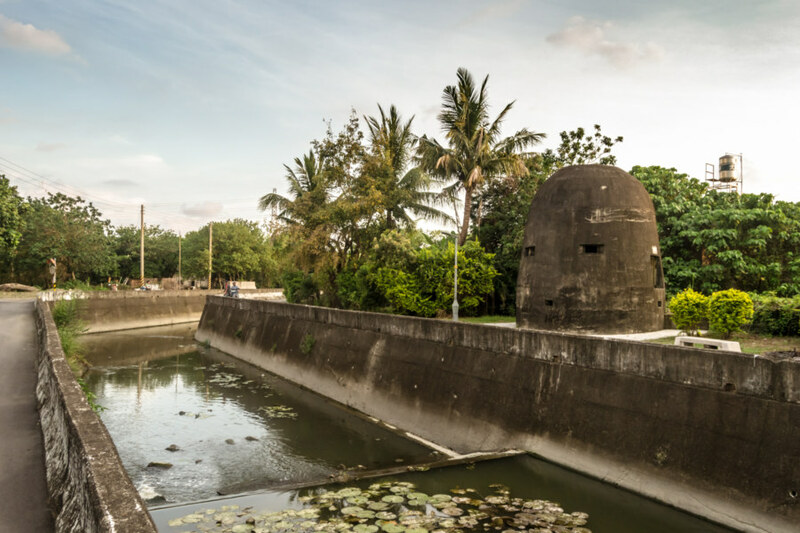 It was built in the Japanese colonial era to protect the town from attacks by allied forces, particularly those dastardly Americans. 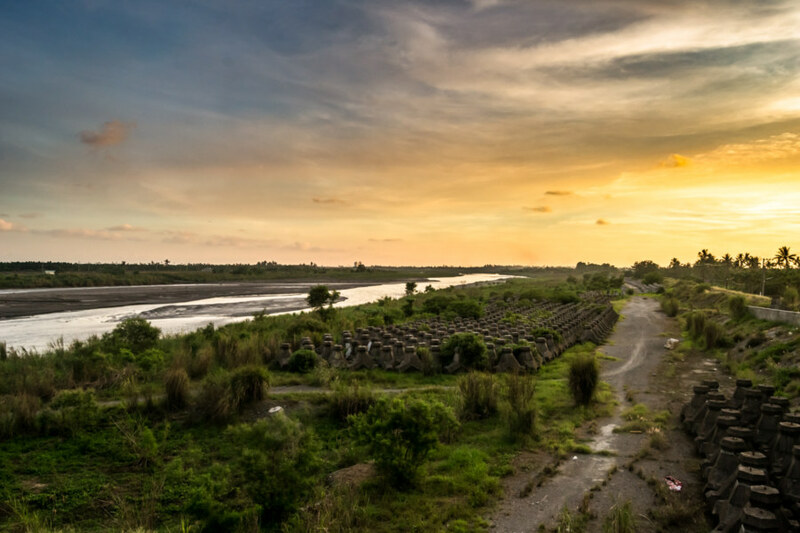 Similar fortifications can be found all around Taiwan near former military facilities, particularly airbases, making this one somewhat unusual. The humble hamlet of Xīnpí 新埤 isn’t likely to have been much of a target. Crossing the Línbiān River 林邊溪 at sunset. After exploring the old fort I headed back to the highway and crossed the sluggish Línbiān River 林邊溪 into Jiādōng 佳冬. Sunset and the gathering gloom of evening offered a respite from the endless daytime heat—as well as new nuisances in the form of insect swarms along the roadside. I continued south, ever south, still not entirely sure where I would spend the night, but not at all worried about it either. Out on the open road in Jiadong District. With fading light there wasn’t much left to see. Deep into Jiādōng 佳冬 I chanced upon a sight that brought me great satisfaction: a vintage sugar train by the roadside! 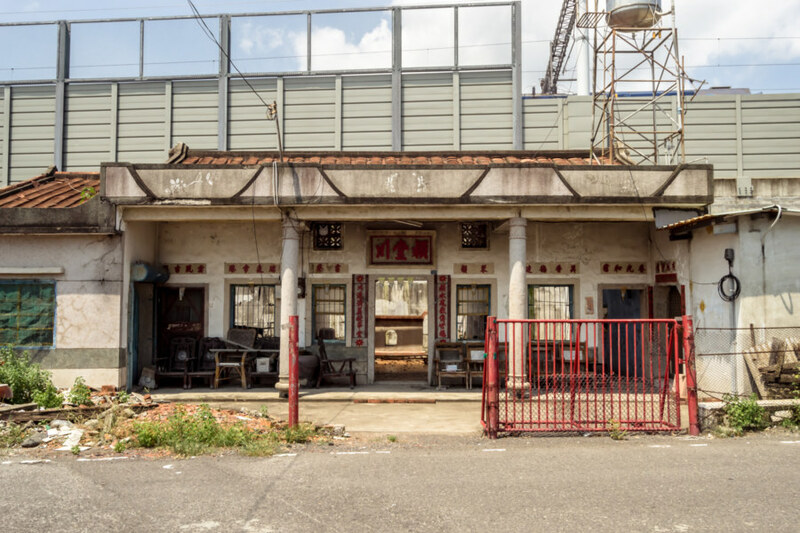 One of the very first things I went looking for on this bike trip was some trace of the sugar industry in rural Tainan 台南. I found nothing more than a set of half-buried tracks along a dusty road on that first day—and here was one of the original engines! Very cool. Now referring to some of the maps I sourced from Taiwan Railways (which might no longer work) it seems I crossed a line running through Chānglóng Village 昌隆村 to the sugar factory back in Nánzhōu 南州, just west of Xīnpí 新埤. 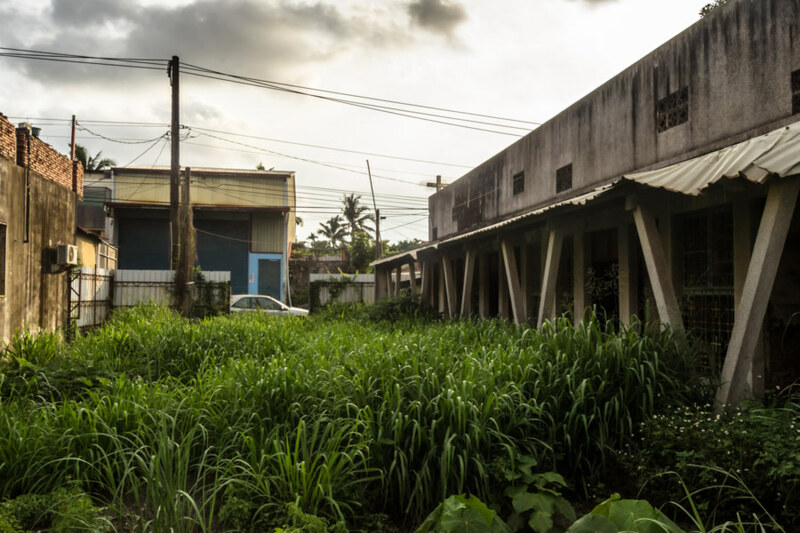 Almost nothing remains of the sugar industry in Taiwan but it was once one of the country’s most important exports. 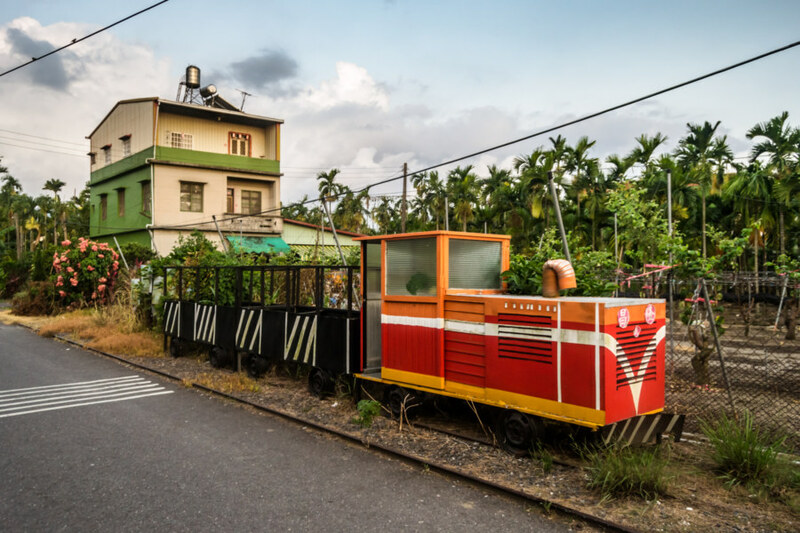 One of Taiwan’s original sugar trains resting by the roadside. 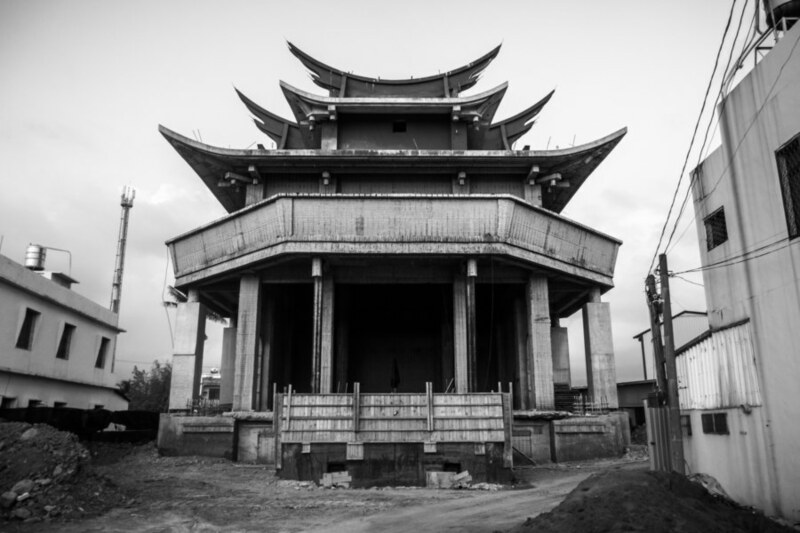 An unfinished temple somewhere in Jiadong. Anyone want to bet who is likely to be worshipped here whenever it is completed? Under cover of night I passed into Fāngliáo 枋寮 and finally left the Liutui behind. There was nothing much to see anymore, only the road up ahead and the many flashing lights of passing motorists as we all traversed the dark countryside. 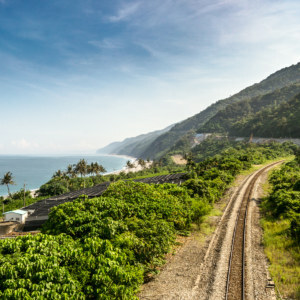 I assumed I might find a decent hotel somewhere near the railway station so I turned off highway 1 and headed into town, a small settlement sprawling along the coastline at the southern end of the Pingtung Plain. When I reached the northern end of the main drag I stopped to appreciate the surreal sight of Déxìng Temple 德興宮 beaming toward the unseen sea. 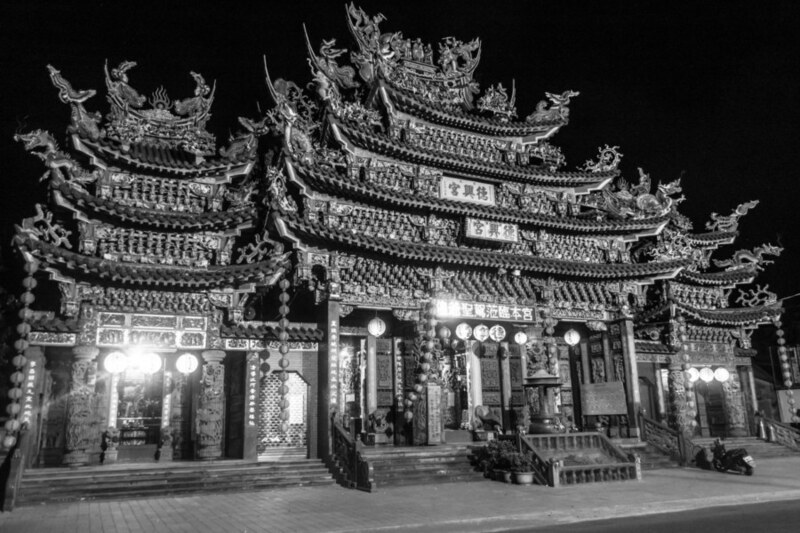 Arriving after dark in Fangliao to the sight of a big temple at the north end of town. I had no luck finding a decent place to stay in the center of town for one reason or another. Instead I cycled back to the highway and found a grungy roadside motel. After a much-needed shower I headed back into town for dinner but almost everything was closed. With nothing more to do I retired to my room, looked over the photos I had taken, and started thinking about where I’d be going next. 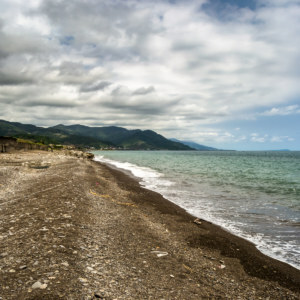 Beyond Fāngliáo 枋寮 there was only one highway leading south along the rugged coastline of the Hengchun Peninsula 恆春半島. This meant I was bound to be repeating the same ride I undertook in 2013 when I cycled from Donggang to Kenting. 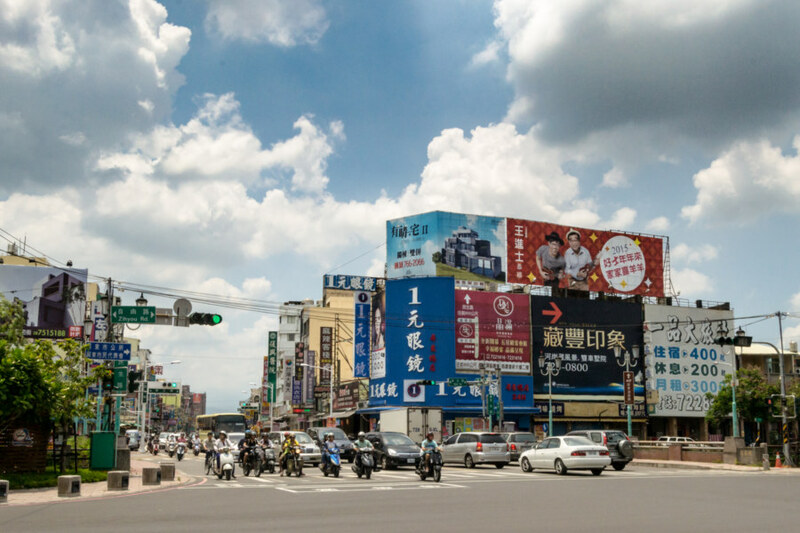 I certainly didn’t mind seeing such beautiful scenery again but vowed to do things a bit differently and take a closer, more informed look at some sights that I had seen on my first spin around this part of Taiwan. 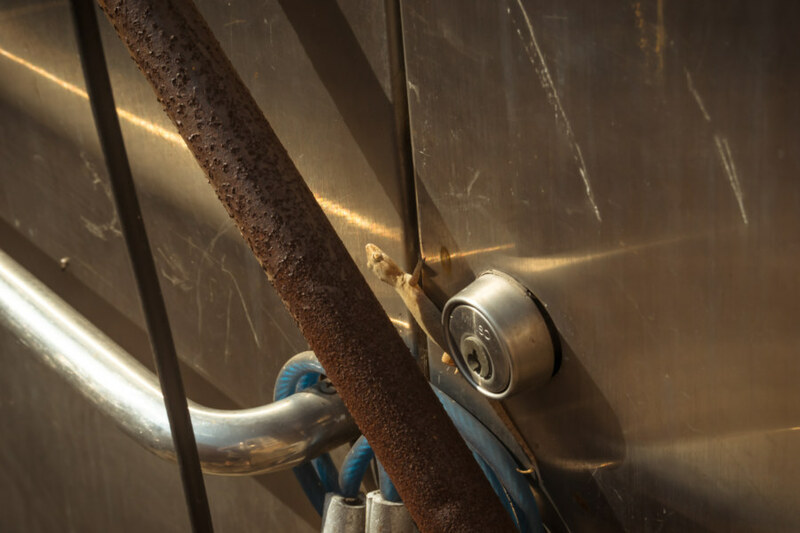 The story continues in the next chapter of my ride around south Taiwan in 2015!